Cacography is a close relative of Calligraphy. In fact, it is the antonym of Calligraphy. If calligraphy was the art of beautiful handwriting, then cacography is the art of bad handwriting (if such an art form exists). This is quite an easy art to master, and its exponents are far greater than those of calligraphy. 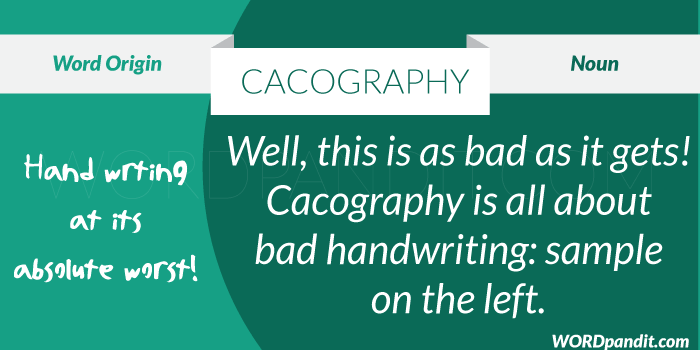 The word cacography literally means harsh or poor handwriting. 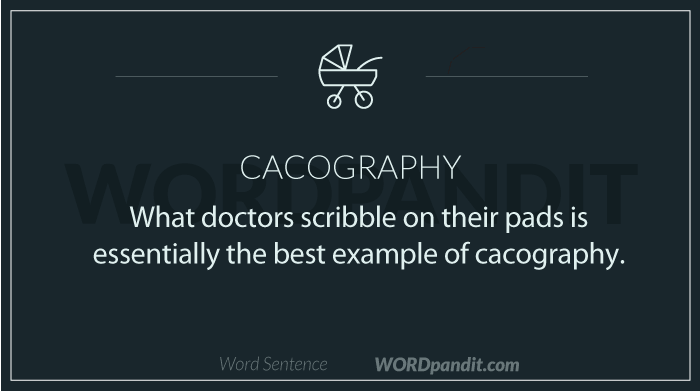 It is derived from a combination of Greek Roots: ‘Caco/kako’ meaning ‘bad, harsh or evil’ and Grapho/graph/graphy meaning ‘to write to record’ (this we know from the calligraphy post as well). Another common word that is derived from the root ‘caco’ is cacophony. It’s the assimilation of the root ‘caco’ with ‘phony’ which stands for sound here. By extension, cacophony means ‘a loud harsh or strident noise’. It is also used in the context of ‘loud confusing disagreeable sounds’. Imagine the person with the worst handwriting in your group of friends. Remember to point it out to him that his handwriting is more of cacography than anything else when you meet him/her next. 1. Cacography and its examples are not that hard to find: almost every second person possesses the ability of writing very poorly. 2. Ramsy has a disability, called cacography, which causes him to mess up any text that he wishes to write.